"Bad Neighbor", cocked and ready to fire. The trebuchet was invented in China in the 5th century BC. It was a more modern version of a siege weapon that was an improvement of a previous one, called the “ancient sling.” It was a significant siege weapon of the Medieval Ages for many reasons. It had many uses, it was used both defensively and offensively, and fought in several battles. 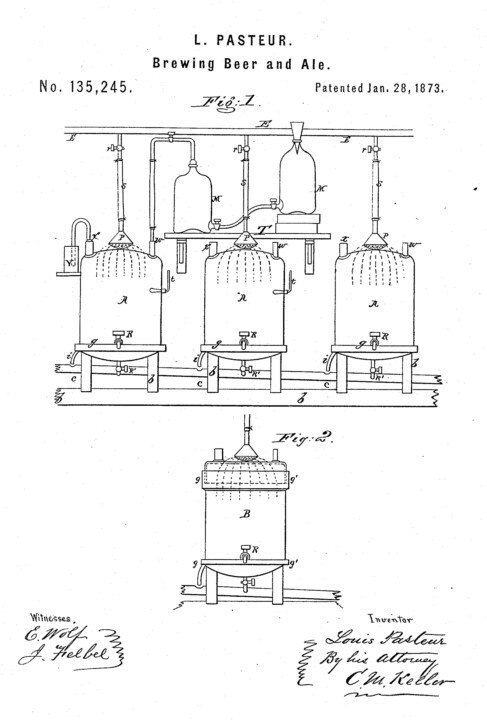 Although it is was very simple in principle, it was very technologically advanced for its time. "Bad Neighbor", in released position. The trebuchet was a very versatile siege weapon. It was a weapon of choice for many armies for numerous accounts. It was capable of launching stones Weighing more than 300 pounds, and made them travel more than 300 yards. It was used both for defense and attack, and was the most powerful medieval battlefield weapon, and was usually very successful, as it was both accurate, and powerful. The trebuchet not only threw stones. It was also threw many other kinds of objects, including horses, men, bombs, animals, and corpses of infected horses and men. Some of these objects were thrown with the object of infecting city defenders with diseases, or to contaminate drinking water, and thus was an early form of biological warfare. "Bad Neighbor", detail of trigger. 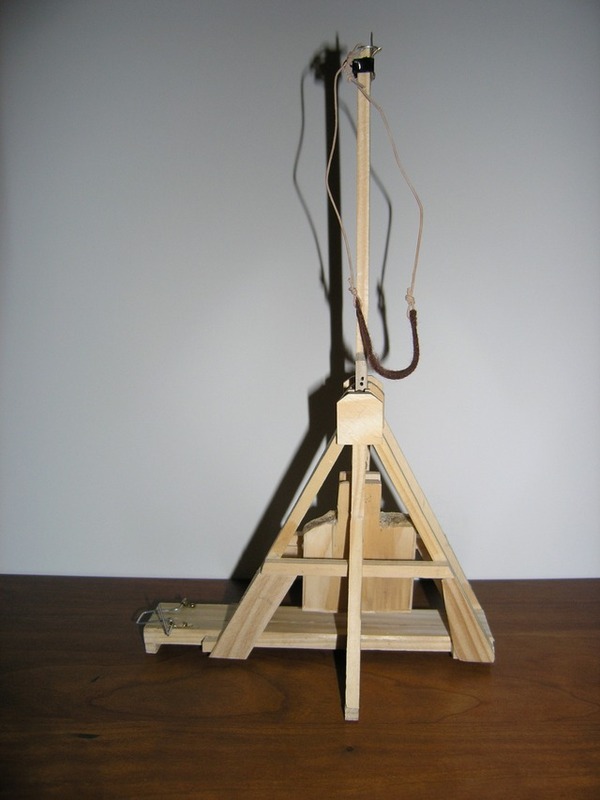 Not only was the trebuchet used in battle, but it was also used to toss rose petals at ladies during tournaments. The trebuchet was used in many influential battles in the Middle Ages. In 1191, at the Siege of Acre, Richard Lionheart constructed two trebuchets called, “God’s own catapult,” and “Bad Neighbour.” At the siege of Sterling Castle in 1304, Edward Longshanks made a giant trebuchet for his English army called "Warwolf" At the siege of Lisbon in 1147, two trebuchets launched stones every 15 seconds, which was a huge advancement for that time period. In 1422, Prince Coribut was the first to shoot manure out of his trebuchet at the siege of Carolstein. The length of the arm on a Trebuchet determined how much power would be exerted from it. The longer the arm, the more force it gave. The longest arm in the Middle Ages was Edward Longshank's that measured 50 feet long, and threw 300 pounds. 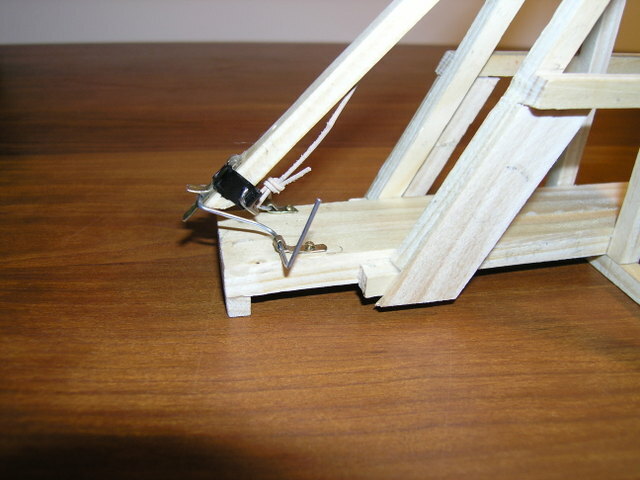 The sling of the trebuchet doubled the power of a trebuchet by both distance and force. Although both large and small trebuchets were incredibly effective, they both had advantages and disadvantages. A larger trebuchet was able to cast objects much farther, but was difficult to move around, required many people to operate (20-100 men), and it had a slower rate of fire. A smaller trebuchet didn't have as much range as a large trebuchet, but it was much easier to move from place to place, and it only took one person to set up for fire. The trebuchet played a huge role in siege weapon technology in the middle ages. It started out as simply a new version of a simple weapon, and developed over the years into a very useful and versatile weapon. 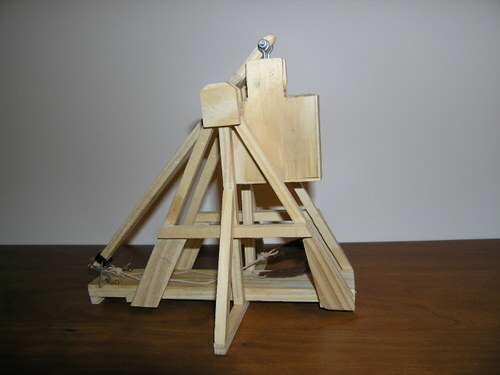 It was the most different, yet powerful, weapon of its time, and it sparked the idea of new, and improved trebuchets to still be used in the future. This trebuchet was constructed with plans found on the internet, at Andy's Home Page, which is a site that gives directions on how to make many different kinds of trebuchets. However, these directions made a trebuchet that was about 3 times the size of mine, so the very first part of my project was to convert all 35 pieces of wood, seven of which had angles, into a smaller scale, so it wouldn't be so large. My next step was to measure and ut each piece of wood needed for the construction. The directions from the ebsite were not very clear (most of the steps were only described in pictures) so for some steps I had to improvise. Many of the pieces that have angles at the ends I had to cut to fit because the angles in the directions did not fit my model. After I had built the base and frame, the next step was to build the arm, which is the main source of power for trebuchets. The counterweight box was filled with approximately 6-8 ounces of BB's, and the BBs were sealed with wood glue and sawdust. I used a segment of a bicycle spoke as the axle of the arm, with bicycle cable ends serving as bearings for the axle to rest on. The instructions from the site for the trigger made absolutely no sense, so I once again, had to improvise. With help from my father, we used a cut down black paper clamp to hold one rope from the sling. We found that we couldn’t screw an eyehole screw into the thin beam, because it would split, so the clamp was used instead. We then used brass picture frame hangers as the release pin for the free end of the pouch line. The release handle was made from a sturdy paperclip, and was bent to form. By placing the release pin under the paperclip handle, and then releasing, the pouch will sling into the air, and release the object in the pouch. The trebuchet was a very versatile weapon during the Middle Ages. I had no idea how much it was used, and how differently it was used! My immediate assumption was that it would only be used to launch stones, but I soon found that it launched much, much more than just stones! I also did not know how powerful it was! It was amazing to me that such a simple mechanism could throw such a huge and heavy object, so far! It seemed nearly impossible when I first read that it would cast stones that weighed 300 pounds, 300 yards in front of them! I did not know how much it had impacted some of the wars that it was used in. If the trebuchet weren't to be invented, I’m sure that some newer inventions inspired by the trebuchet would have never come to be. 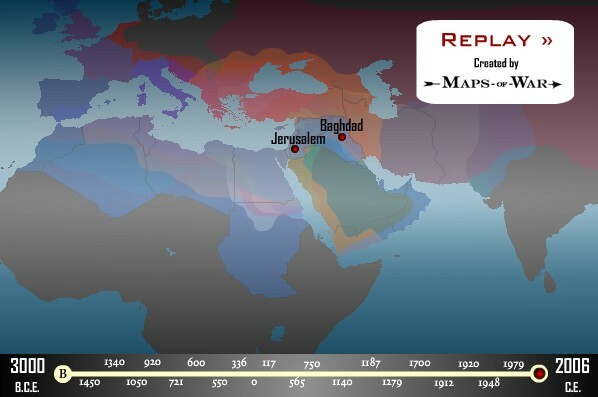 This site, Maps of War, has an animated display that shows a timeline of the various empires that have controlled the lands around the Mediterranean. Hit "play" and see who has controlled the Holy Land as well as the rest of the region over the years. 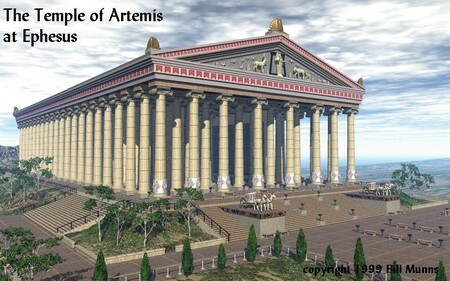 The Temple of Artemis at Ephesus was counted as one of the Seven Wonders of the Ancient World, that list of marvels that ancient world travelers were fortunate to visit in their lifetimes. 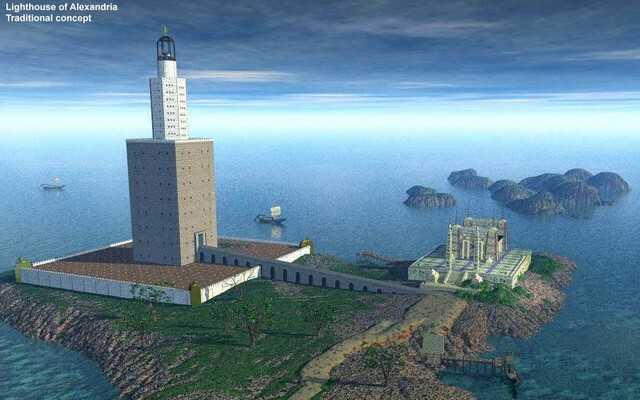 The historian Philon of Byzantium said "I have seen the walls and Hanging Gardens of ancient Babylon, the statue of Olympian Zeus, the Colossus of Rhodes, the mighty work of the high Pyramids and the tomb of Mausolus. But when I saw the temple at Ephesus rising to the clouds, all these other wonders were put in the shade." The Temple was built in Ephesus near modern day Selcuk in Turkey. It was built in about 560 B.C. on the site of much older temples to Artemis and other Greek gods. It was built so that broad steps led up to a rectangular terrace on which the temple was built. It was rectangular in shape, and approximately 260 ft by 430 ft (80 m x 130 m). 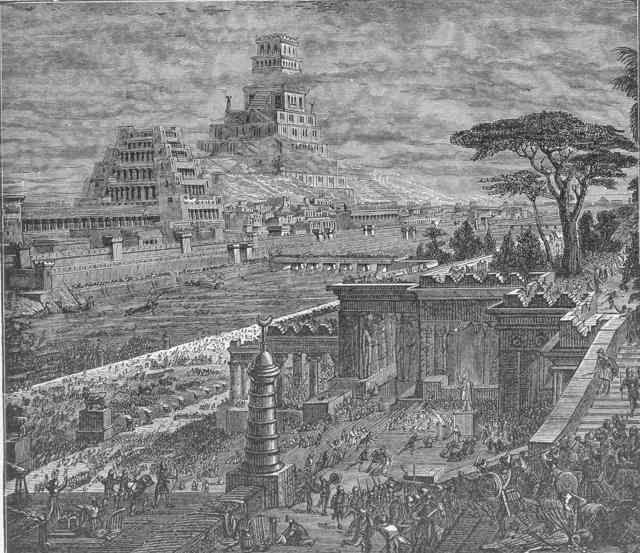 The building (the 323 bc version) consisted of a roof held up by 127 marble pillars, each 60 ft (20 m) high. The base of the pillars was decorated with extensive carvings and artwork. The pillars were arranged aound the perimeter of the building, with the center being left open. The temple was burned down the same year that Alexander the Great was born, in 356 B.C., and rebuilt by 323 B.C. It was again destroyed by the Goths and rebuilt in 263 A.D. The temple was finally torn down permanently in 401 A.D. by St. John Chrysostom. When ancient references were used to find the site of the temple in the late 19th century, the local residents had never heard of it, and it was buried in 20 feet of swamp and overgrowth. After excavation in the early 20th century, a single column reconstructed from the debris now stands on the site. The drawing below is from Bill Munn's Seven Wonders of the Ancient World site. By comparison, the Lincoln Memorial, built in 1922, is 188 ft x 118 ft, with 36 columns 44 ft tall. 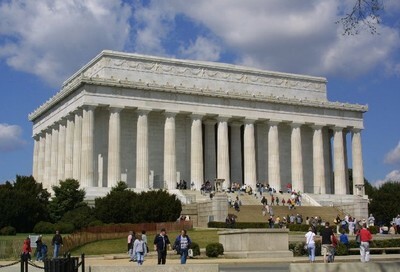 This photo of the Lincoln Memorial is courtesy of Keith Stanley, www.kestan.com . In the mid 3rd century BC Rome had conquered all the other states of the Italian peninsula, and looked abroad to the islands of the Mediteranian for further conquest. But those islands were subjects states to the city of Carthage of North Africa. 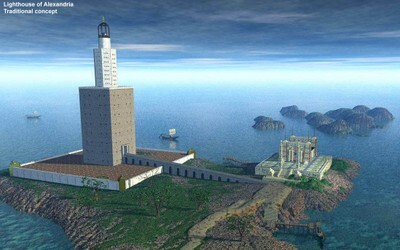 Carthage was a Phoenician colony located about where modern Tunis is today. The Phoenician's had a naval and seafaring tradition that dated back to antiquity, having sailed a fleet around Africa in 600 BC, having been the naval arm of Xerxes during his invasion of Greece, and having been the naval arm of Egypt for millenia. 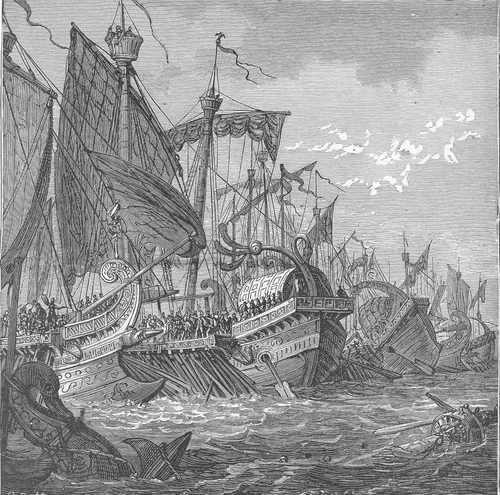 When the Romans bumped into Carthage the Romans had almost no navy, and no experience fighing naval battles. Their largest ship was the trireme, with three banks of oars, and they didn't have many of them. 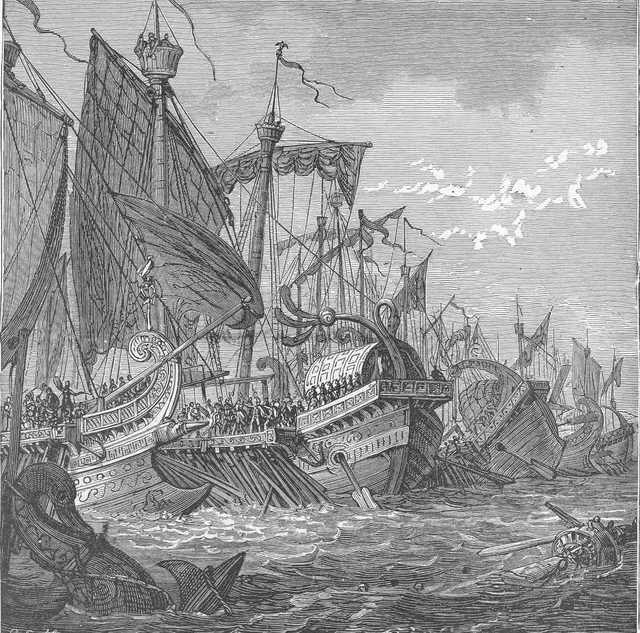 The Roman trireme was no match in numbers, size, speed or armament to the Carthaginian quinquereme, with five banks of oars. But the Romans didn't know how to build the larger more advanced vessel. Then one day a storm wrecked a Carthaginian quinquereme onto an Italian beach, and within two years the Romans had a fleet of 120 of quinqueremes. The Romans still didn't know how to fight a naval battle, but they knew hand to hand fighting on land. In the first battle with the new Roman navy, in 260 BC, the Carthaginians were confident of victory. They bore down on the Roman navy and were surprised by two new inventions and a new tactic in naval warfare. Using newly invented grappling hooks and boarding bridges, the Roman lashed the attacking ships to their own, boarded them, and converted the battle to their forte, a hand to hand mellee. In one battle the Carthaginian mastery of the sea was overthrown, and the Punic Wars began. 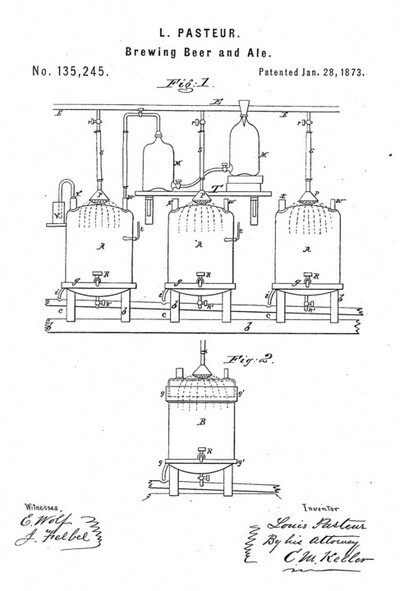 Drawing from the History of the World, Ridpath. In 481 BC when the Persian king Xerxes was going to invade Greece for conquest, he assembled a huge army from his tributary states. They were so numerous that it was hard to count them. So they counted out 10,000 and had them stand in a densely packed circle. Then they built a waist high wall around them. Then they had the rest of the troops enter the walled circle until it was full, and called it 10,000 per filling. The Persian army filled the circle 170 times, for a head count of 1,700,000!! Of these there were 80,000 cavalry, 20,000 charioteers and camel riders. This was and is the largest army ever assembled in the history of the world. 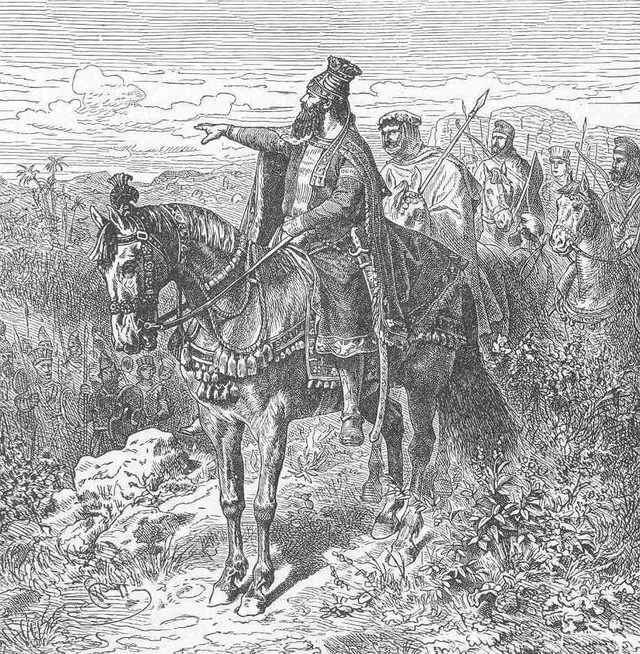 The Persian army was made up of armies from each province or satrapy of the kingdom, and my theory of the purpose of the head count is that this technique was to verify the number of soldiers that each provincial governor said he had contributed, which might have been an inflated number. The Persians continued via a land march to the Pass of Thermopylae, where they were faced by 300 Spartans and 8700 Greek soldiers from allied cities. The Persians finally got through the pass, at a loss of 20,000 killed, and the Spartans killed to a man. Necho II was the Pharoah of Egypt from 610 to 595 BC. 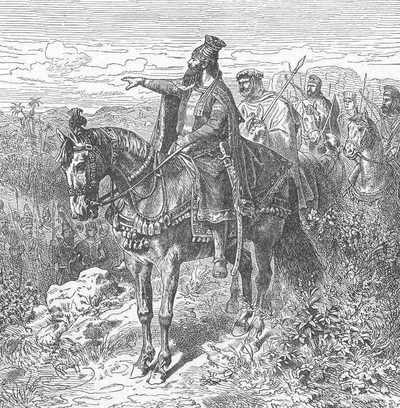 His reign saw some momentous projects, including the start of construction of the first Suez Canal in about 600 BC and a major military defeat in Syria at the hands of the Babylonians. Another big project was the circumnavigation of the continent of Africa. Necho ordered a fleet manned by his allies the Phoenecians, to sail south along the coast of Africa to the land of Punt, where regular trade was conducted for antimony and incense. The fleet was then to continue along the coast of Africa into unknown water. It seems that the fleet departed in July, and reached the Horn of Africa where they put ashore, planted wheat, and stayed long enough to harvest the wheat for provisions. Sailing and rowing on after the harvest in November, they sailed until planting time in the Spring came again. They again put ahore and planted and harvested wheat. Again in November they pushed on with the coast of Africa to their right, but they were going north by then. Going around the bulge of Africa, they finally encounted the westernmost Phoenecian colonies along the Morroccan coast. 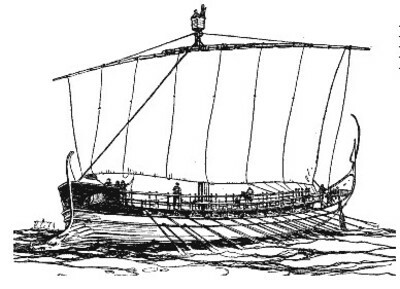 The ships used were likely Phoenecian and Egyptian warships, possibly triremes, forming a mixed fleet. "the Phoenicians made a statement which I myself do not believe (though others may if they wish) to the effect that they sailed west around the southern end of Africa, they had the sun on their right". However this comment adds to the credibility of the account, since a west sailing ship in the northern hemisphere has the sun on its left side, but in the southern hemisphere the sun is on its right side. Since Herodotus did not know about the equator and the Earth as a sphere, this statement would have not appeared to make sense. The Greek scientist Eratosthones didn't calculate the circumference of the Earth as a sphere for another 200 years, in 205 BC. The first major wall was built during the reign of Qin Shi Huangdi, the first emperor of China during the Qin (Ch'in) Dynasty (221 B.C - 206 B.C.). It was created by joining several existing walls built previously by regional governments. This first wall was built much further north than the current Great Wall, and made of materials that have largely dissappeared over time. 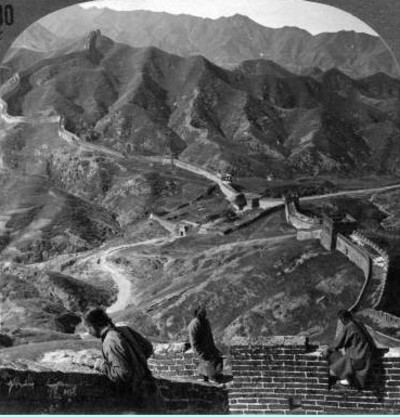 The Great Wall that can still be seen today was built during the Ming Dynasty (1368-1644), on a much larger scale and made of stone on the sides and top. The wall housed garrisons, signal fires, and a messenger and postal service. The primary purpose was to make it difficult and slow for nomadic armies to get their horses across the wall. Without their horses the Huns were not a serious military threat. It is 4000 miles long, or 6400 km., and is visible from Earth orbit.